The Intel® Server Board S7200AP product family is a purpose built, single socket, half-width board ideal for HPC workloads demanding a high level of parallel compute processing performance. 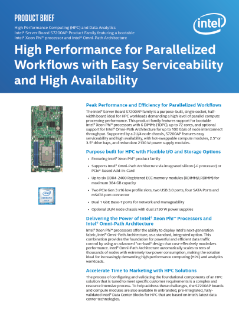 This product family features support for bootable Intel® Xeon Phi™ processors with 6 DIMMs (1DPC), up to 72 cores, and optional support for Intel® Omni-Path Fabric Technology for up to 100Gb/s of node ...interconnect throughput. Supported by a 2U/4 node chassis, S7200AP features easy serviceability and high availability, with hot-swappable compute modules, 2.5" or 3.5" drive bays, and redundant 2130W power supply modules.